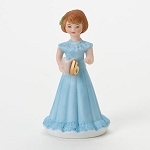 The Enesco Growing Up Girls brunette two-year-old girl is wearing a blue dress with a pretty blue bow in her hair. The figurine is crafted of porcelain bisque. 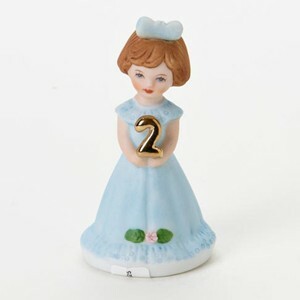 The two-year-old figurine is also available with blonde hair. From the Growing Up Girls figurine collection.